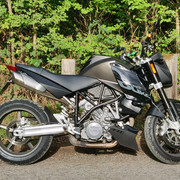 superduke forum • View topic - Might paint my front headlight mask Titanium. Thoughts? Might paint my front headlight mask Titanium. Thoughts? Does anyone have an idea where I can get the right titanium paint to match my tank? Re: Might paint my front headlight mask Titanium. Thoughts? I'd just find a paint supplier, they'll mix the correct colour and supply it in a rattle can. I remember seeing all the actual paint codes on a thread here a long time ago. Have a search - if you find the code any paint shop can make it up for you.